Once upon a time, in the days of unbridled free time, less financial demands and long before parenthood, I traveled to eat. Many of my travel decisions were based on where I could satisfy my epicurean curiosities and find interesting tastes and culinary inspiration. Those days, needless to say, are long gone. Travel has become more about visiting family and discovering experiences that are more inclusive to our family’s interests. Luckily, food exploration is now becoming a family past time. We recently had the opportunity to visit one of my favourite cities, San Francisco. I was delighted to show our almost 9 year old some of my favourite neighbourhoods and places including some old and new favourite food destinations. gnocchi with mustard greens and grainy mustard from Cotogna: perfect balance of richness, bite from the mustard greens and tang and texture from the large grains of mustard. nettle pizza: Spring is calling! 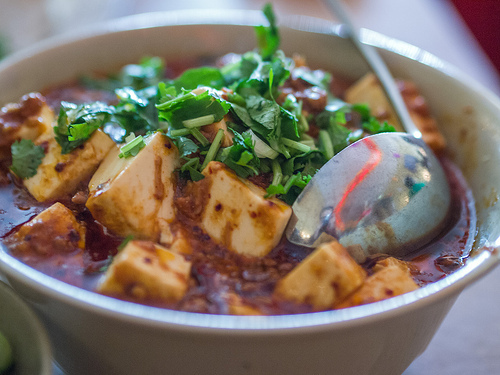 intense ma po tofu à la Mission Street Chinese: best ma po tofu I’ve ever had! 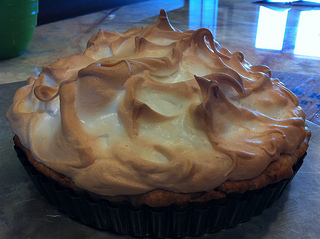 lemon meringue pie. Because I was able to make a gorgeous one on the fly while visiting friends and realize I ought to be making more pies. more support of the local food movement. CUESA has a huge presence in SF, so would love to see broader support of the food system in BC. One of the ways to make this happen is to shop at the markets more. Any favourite food and travel destinations?